Months later I’m wandering through the grocery store in Boulder and I spy green mangoes on sale for $1 each. In Colorado, that’s cheap. But I have never purchased green mangoes before. I always eat mangoes as fruit: ripe and sweet. I walked past. And then the memory of those pickled mangoes popped into my head and I found myself backtracking in the produce section. I sent Diane a text and asked if those pickled mangoes were made with green mangoes. Yes. How would you pickle them? Not sure… try vinegar, sugar, chili and let me know how they turn out! It was worth a shot. I knew from the photo I had taken of Diane with the large jar that there was sugar, chilis, and based on my taste memory, rice wine vinegar. This kind of pickle is ready in about an hour but will keep (refrigerated) forever. I totally wung it because I had (and have) no idea what I was doing. These pickles are pretty close to what we had. There is no doubt in my mind that it could be tweaked with all manner of other flavors. I mean, make it your own, right? I really liked them to the point that I ate too many and felt like they were burning an acid tunnel through my gut. So then I stopped eating them for a while. But the other day I found them in the back of my fridge and had a sample. Good pickles. Good times! 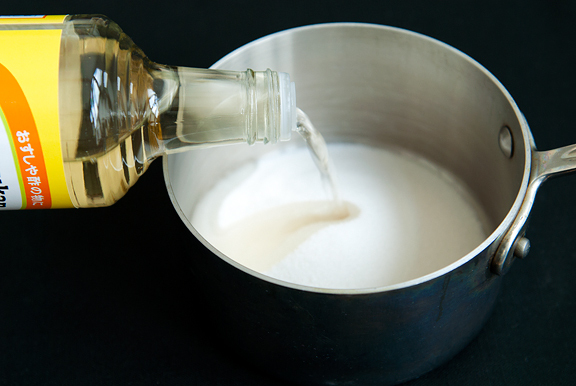 Combine the rice wine vinegar and sugar in a small saucepan and heat over medium flame. Stir until the sugar melts. Remove from heat and let cool. 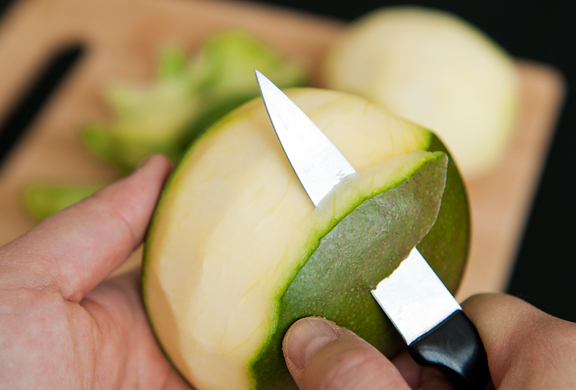 Peel the mangoes and slice the flesh off the stones. Slice the chiles. 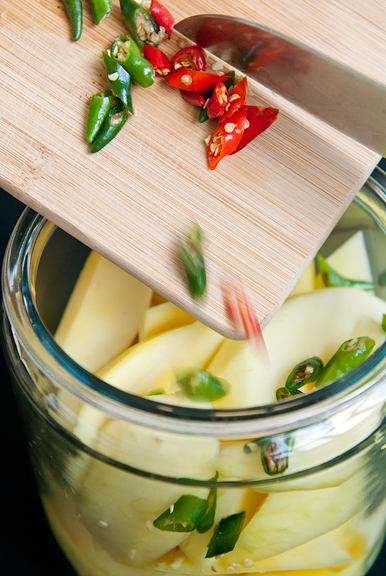 Place mangoes and chiles in a large container and pour the cooled vinegar over everything. Cover the jar and refrigerate for at least a couple of hours before serving. Will keep in refrigerator for a few weeks (at least). That recipe sounds and looks good! 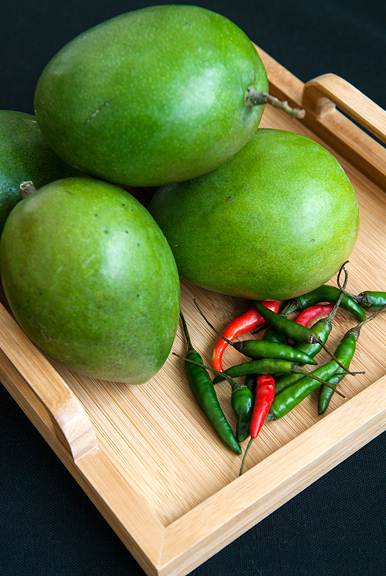 I love the idea of pickling green mangoes. That’s my kind of pickle: sweet, acidic and spicy. So interesting that it’s made with mangoes. 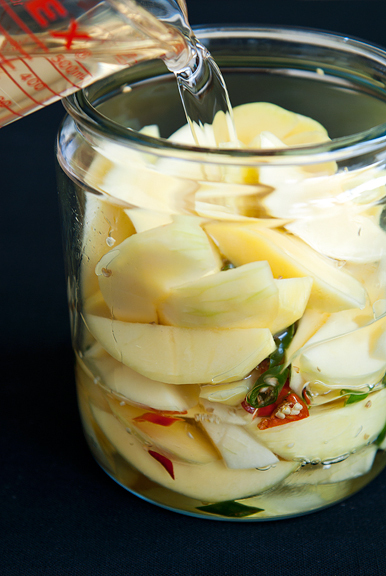 I love this recipe..basically countertop + super fast pickling. With no added salt, only using sugar, omg this is MY kind of recipe. Actually Ani Phyo (my raw vegan chef idol) pickles food this way and I have posted in the past about it…but gosh, never with mangoes. YUM!!!!!! This is such an interesting recipe. I never thought you could make mango pickle but then again a friend of mine says you can pickle anything! I love to get away, travel is always on the horizon. We often get away every weekend for biking or climbing adventures. When we are ready to pack up and go home I usually can’t get there fast enough. I want my space, my things, my food – my comforts. Yummmmm, these look so good and so simple to make. I bet they would be a nice, crunchy accoutrement to any number of dishes, too! Have you tried Persian pickles? They usually come canned. Super sour and crunchy and delicious!!! Lol, a traveling homebody- that describes me perfectly. I think it just means we don’t like working in an office! ;) You and Diane must have pickles on the brain this week. Two great recipes! Yeah, mangos are a dollar apiece here too. Cheaper now than in the summer! I couldn’t resist and canned up some mango chutney. Been wondering what else I could make with them. Can’t wait to try these pickles tomorrow. my mom makes something similar. she is going to love your recipe. Jen what’d you think of Little Saigon’s pate chaud? I can’t get enough of them I have to stop by a local bakery and get one once a week! thanks for the recipe! what a great trip, hope to do it again soon. The mangoes are killer good, but you’re so right about the acid in the gut. hah. Love the shot of J & K! yip for new photo gear too!! 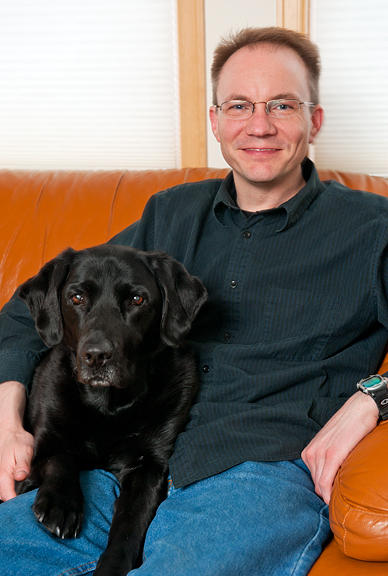 your dog is beautiful & looks so healthy, do you mind if i ask what you feed him/her? I love mangoes. This is an interesting recipe and one that i will try! I am so going to do these. 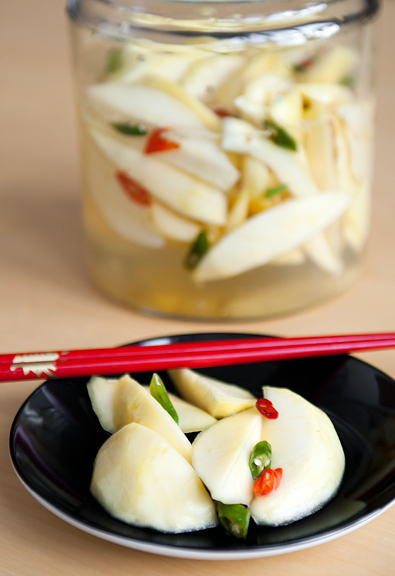 I have no doubt they are amazing, with the rice vinegar + the Thai chilies, they can’t lose. Off to forward this to the oldest, she will be delighted. Magda – I have also heard that you can pickle anything! :) Sounds great!! 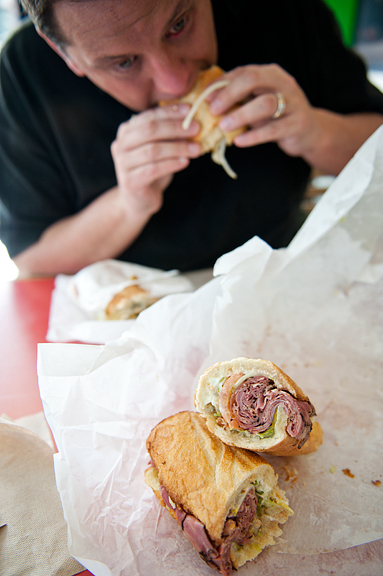 Phoo-D – I think I had pickles on my brain this week. Diane has them on her brain EVERYDAY! ha ha ha. Andrew – oh the pate chaud is SOOOO good. I’m a little glad I don’t live so close by or else I think I’d get one every day. Mmmmm. Judy – Kaweah used to eat Iams large breed, but now she’s on Iams senior food. We don’t do much more than that. I think we’ve been very fortunate that she’s such a healthy girl. Thanks! vivian – aww, I bet she would be proud of you. I lived on Guam for many years and we had a mango festival every July. The variety of pickled mangos the locals made was amazing. There were hot and spicy, sweet, and kim chee spiced. I am just getting my pickles juices going. I’m with all you pickle freaks it makes my salivary glands go wild. 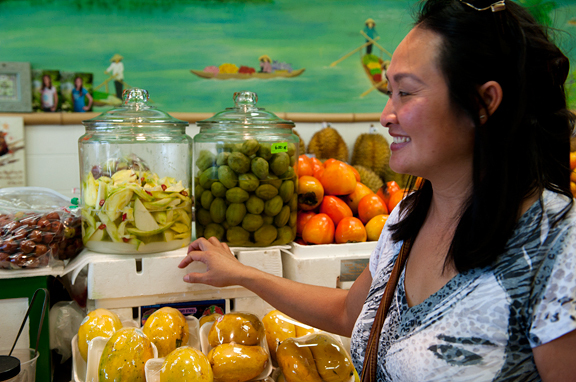 I also had pickled green papaya for the first time while living on Guam. That is as good as anything else pickled. I just did green beans today. I’m new to pickling, but will try anything. Has anyone tried using ripe mangoes? 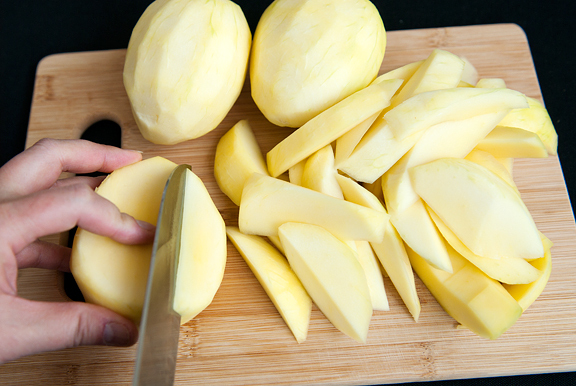 Amy – Green mangoes will be much better for a more crisp texture. Have 2 mango trees. Always pick up the small fallen fruit. Those that have the signs of fluid on the stem & a bit down the side are saved..these will make perfect pickles! Thank you so much. Yes, I have made salsa after windstorms. this is a great alternative. I do this a lot but use equal parts of sugar and vinegar. I also do it with Green Papaya.